今年最盛大的活動即將展開了! YTSA orientation 即將在十月一號盛大舉辦,活動從下午1:30到晚上9:30, YTSA精心準備了許多表演與遊戲,還有美味的台式便當以及免費天仁&Tea shop 168飲料!現在到YTSA booth 預購便當可以享有優惠價格($6, orientation當天購買原價$9), 歡迎與我們一起共襄盛舉!! One of the larget event of a year is finally here! The YTSA orientation is on Oct 1st. 2010, 1:30 pm ~ 9:00pm. We prepared lots of shows and games, as well as delicious Taiwanese bento and free TenRen & Tea Shop 168 drinks. Order your bento at YTSA booth for cheaper price($6, original price at orientation is $9), come meet more friends and have fun!! There is more events and discount, joins us right now to get more information! For thoes who take TTC, you can take 60 steeles west at Finch station or 196 York university rocket at Sheppared station and get off at york university. 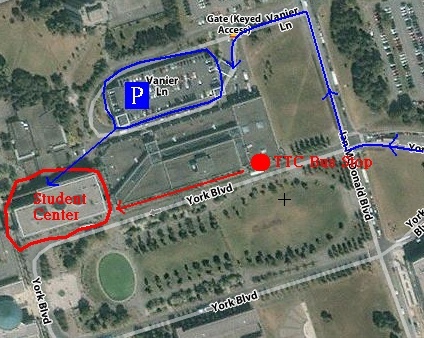 Student center is at the end of hall way where there is KFCin the food court, when reach there go to room 313. 自行開車者可以沿著下圖藍色路線進York Lane 停車場, 出停車場後往西南方走,穿越垃圾放置場後就抵達Student Center. For thoes who drive, you can follow the blue line in the map below to York Lane Garage. Exit garage from south west door way, Student center is one minute away. Cant wait for this BIG event!!!! This really makes me exciting!!!! yes tiki, join us and get more benefit!!!! Cant wait for this DAY!!!!!!!!! im from guangzhou as well..